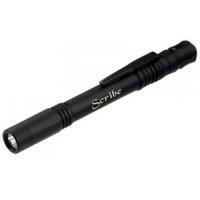 The Scribe LED Pen Light from ASP is a lightweight everyday carry tool, well-suited for low-light settings or serving as a compact backup option. The powerful XPG2 LED offers 130 lumens of brightness, meeting ANSI FL-1 standards. The mirror-polished aluminum reflector results in a strong center beam and halo capable of illuminating an entire room. ASP crafts this device from rugged 6061 aerospace-grade aluminum and finishes the body with a matte black Type III anodized hard coating for added resistance to corrosion. The Scribe's lens is made with precision ground glass and optically coated on each side for a consistent, luminous beam. A constant current circuit board and the 18K gold tip contacts maintain a constant current, operating at optimal levels without overheating for a maximum of 90 minutes on one charge. The flashlight is powered by AAA alkaline batteries; however, for the best performance, choose ASP's lithium power cell batteries. Convenient carry of the pocket-sized Scribe is possible with the heat-treated, removable pocket clip.